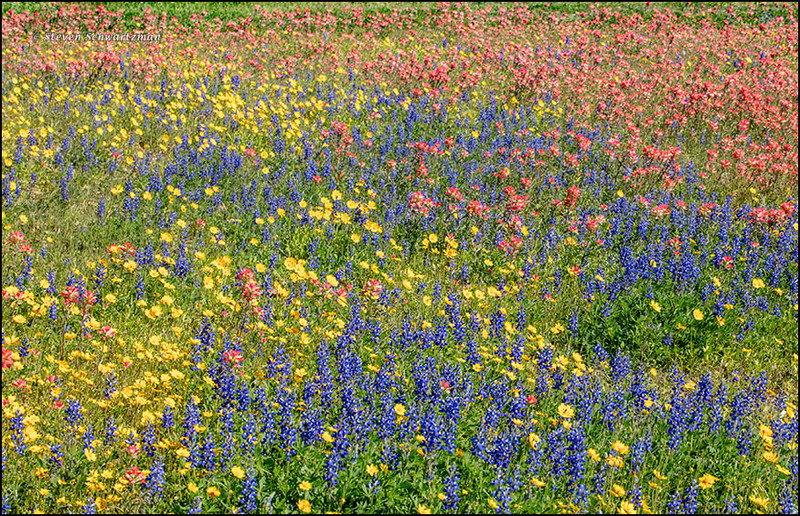 In the spring Texas does wildflowers. Prompted by reports of good sightings a little over a hundred miles from home in Cestohowa, we headed south on March 18. We began finding good things just past Seguin and even better ones after we detoured a little from our route to check out New Berlin. 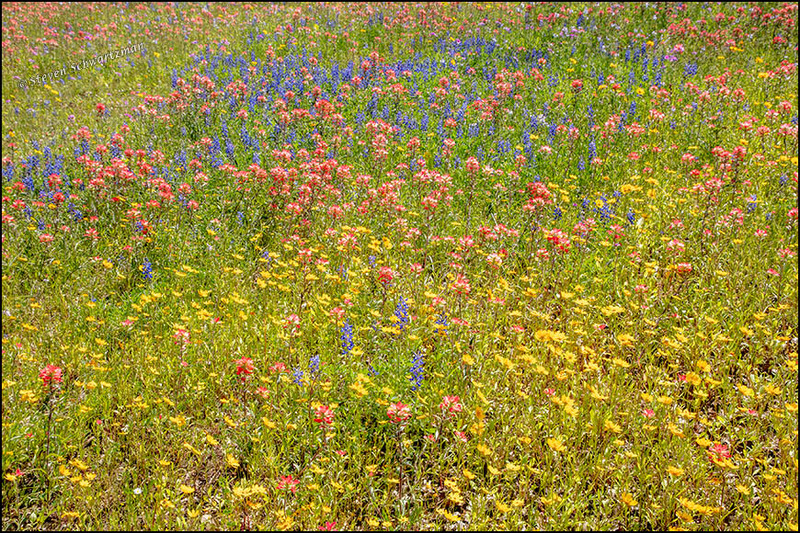 In fact the wildflowers were so bountiful on some of the properties in that area that we never got any farther. Sorry, Cestohowa. 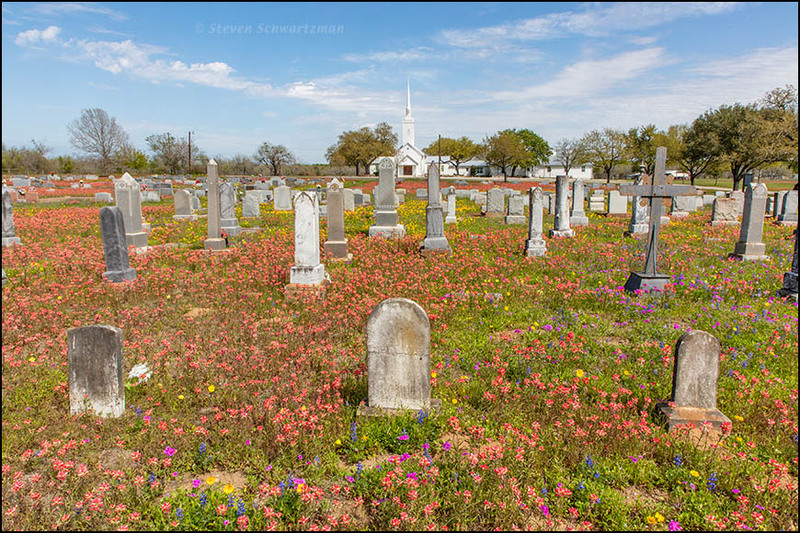 To my mind, every cemetery should be covered in wildflowers. The tombstones are interesting, with the oldest ones dating from the 1800s and inscribed in German (remember, the town is New Berlin). Still, as this blog is devoted to nature, here are a couple of photographs that focus on the profuse wildflowers in their own right. The colonies were so intertwined that I was able to frame the flowers in lots of ways. The bright yellow ones are Nueces coreopsis (Coreopsis nuecensis). 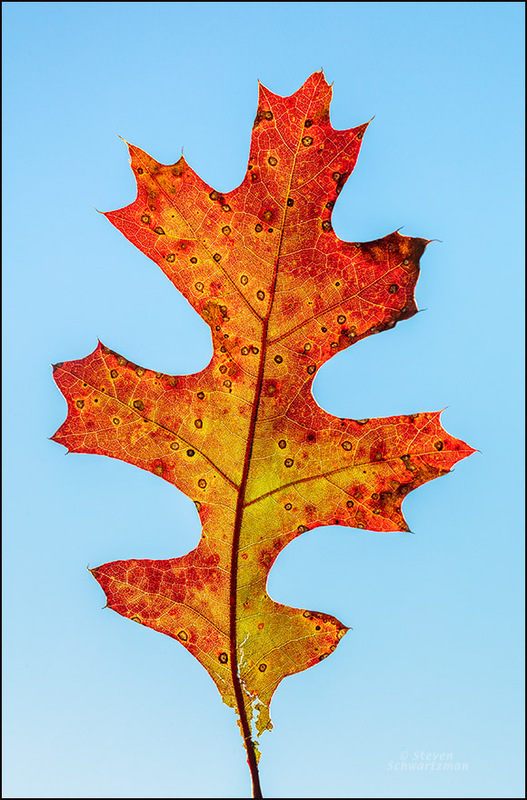 From my neighborhood on January 4th comes this emblematic leaf of an oak (Quercus spp.). You could say the composition is minimalist; you’d have trouble making that claim about the color gamut. Notice how far into the season we were still seeing isolated instances of colorful foliage. 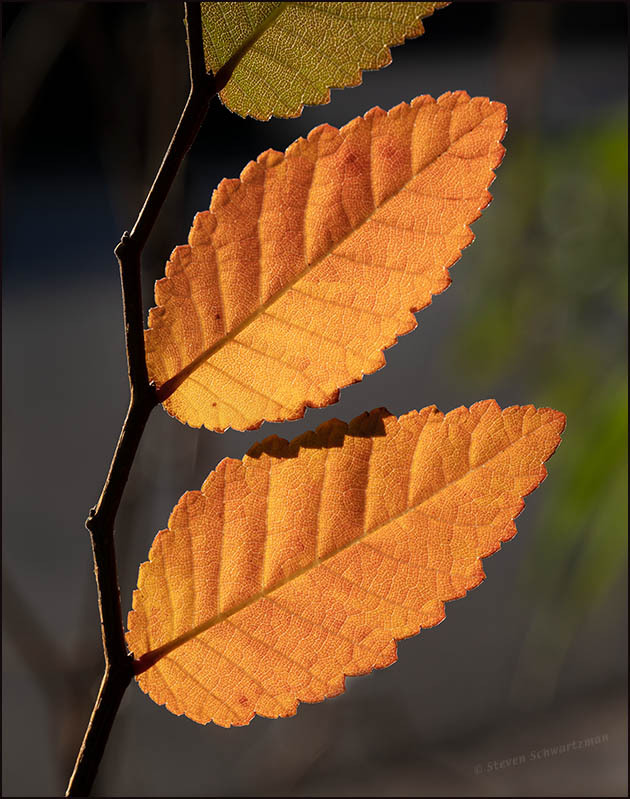 The same outing brought another example, this time from a cedar elm (Ulmus crassifolia). 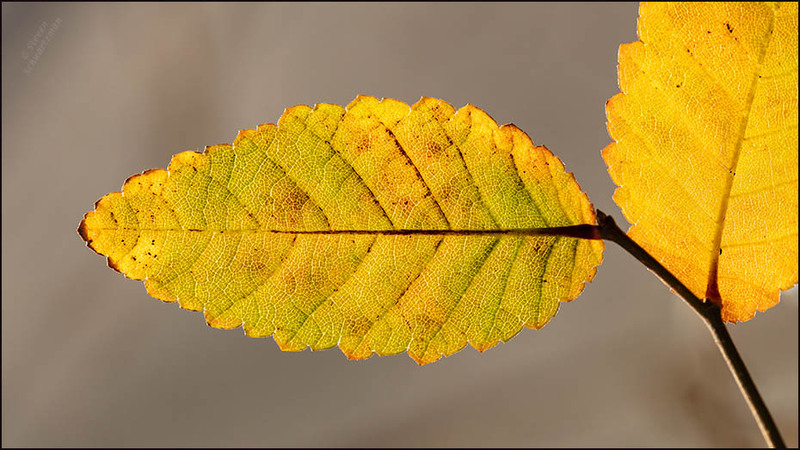 While yellow is the most common fall color for cedar elms, I also found two leaves that had turned orange. 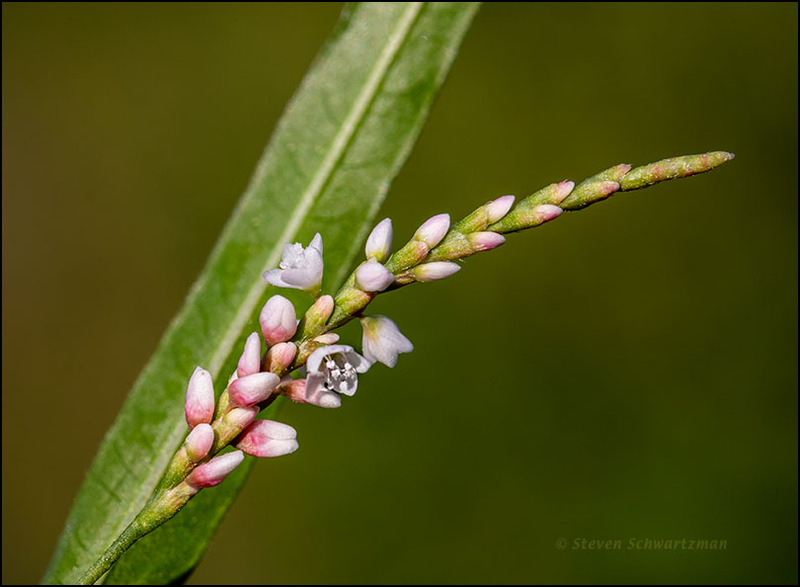 After doing my theme and variations with prairie agalinis in the northeast quadrant of Mopac and US 183 on September 19th, I noticed a colony of smartweed (Polygonum spp.) that I’d overlooked. To give you a sense of scale, I’ll add that each smartweed flower is no more than one-eighth of an inch (3mm) in diameter. Smartweed leaves have a tendency to turn bright colors when they age. I photographed the one below in roughly the same stance as the flowers and buds above, and with the backlighting that lit up the prairie agalinis in the previous post’s close views. 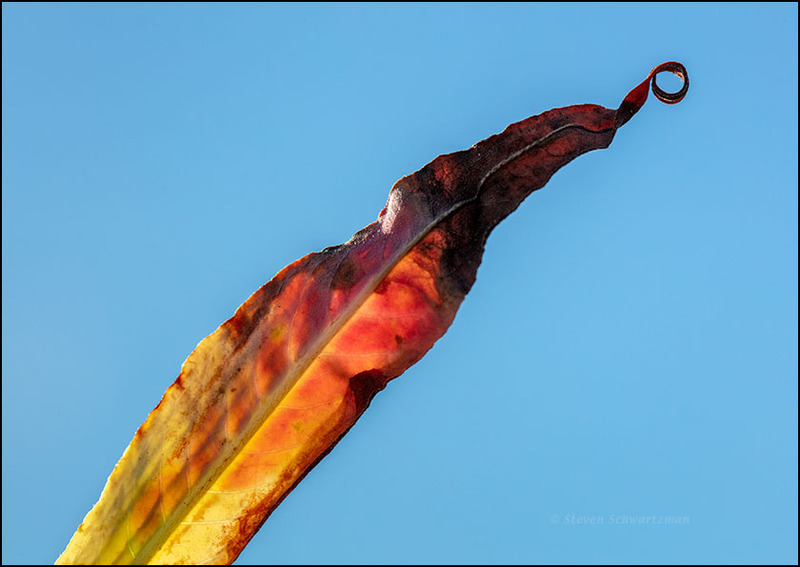 And how about that little curlicue at the leaf’s tip? 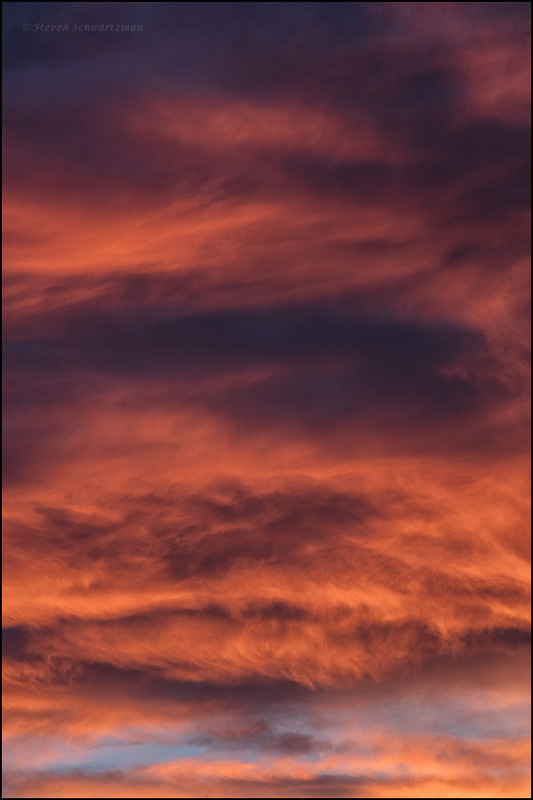 I’d forgotten that a year ago today we saw this great sunset at Napier. 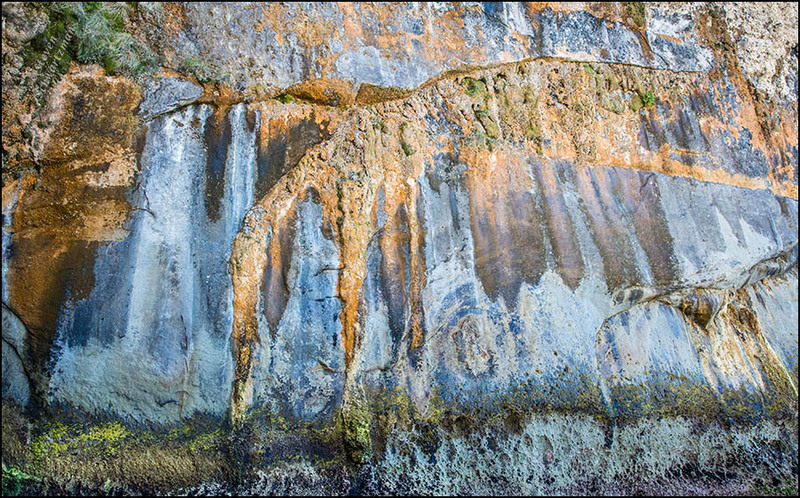 Close looks in the opposite direction from the one in yesterday’s view revealed colors in the mosses, minerals, and lichens near the base of the cliffs at Tunnel Beach on February 26th. Welcome to a tree that’s native in central Texas but that has never appeared in these pages till now: Sapindus saponaria var. drummondii, known as western soapberry. I couldn’t help noticing this one turning colors on the afternoon of November 30, 2016, outside the office at Monument Hill State Historic Site in La Grange, some 75 miles southeast of my home in Austin. 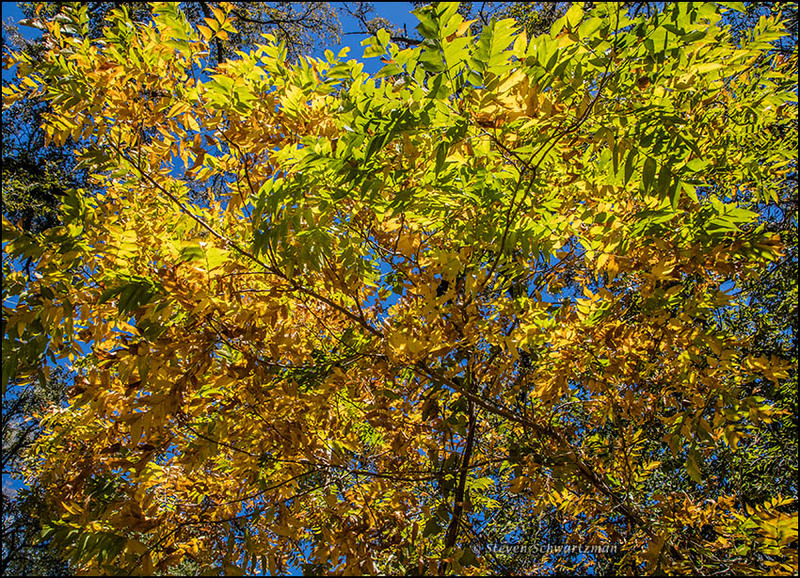 It wasn’t only above me that I found fall foliage. 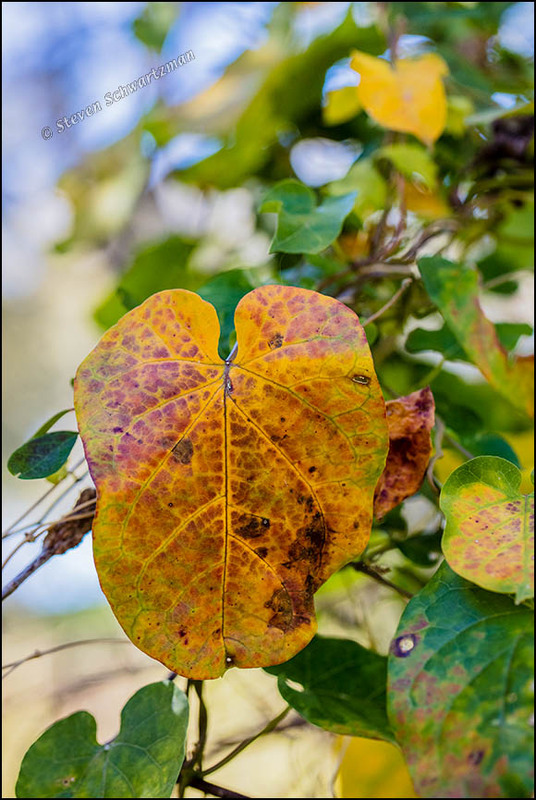 Close to the ground I noticed some vine leaves becoming patterned and taking on warm colors. I believe the plants were pearl milkweed vines, Matelea reticulata. Most people go to Indiana Dunes State Park to see the dunes and the beach along Lake Michigan. 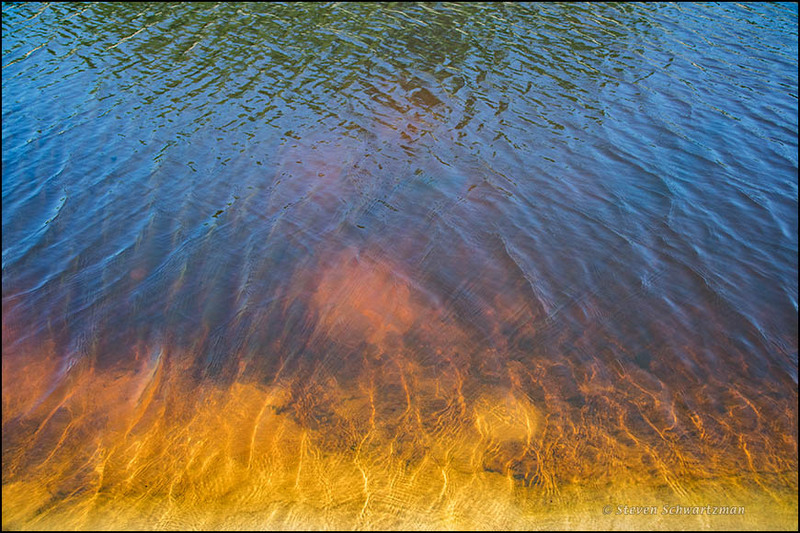 That’s why I went there on June 17, but I also couldn’t help noticing and being intrigued by the colors of Dunes Creek close to where it empties into Lake Michigan. 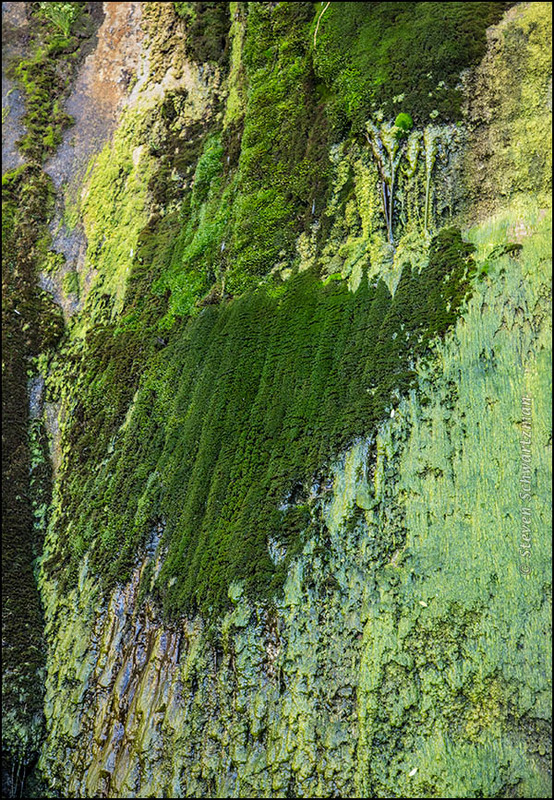 I’ve read that the warm colors are due to tannins released by black oak leaves that fall into the creek and decay there.